Calling all trainee witches and wizards! This September, prepare to be whisked away into the wonderful world of The Magician’s Chamber and an incredible Arthurian adventure. With our spellbinding magical mix of myths and magic, your child will meet the Rabbit in a Hat, dance The Broomstick Flick and stop wicked Morgan Le Fay from turning the baby King Arthur into a hamster! Our weekly workshops for 4–7 year olds are run by an expert team who create a magical space for imaginations to run free. There’s nothing like a mix of rap, rhyme, rhythm and song to help confidence soar and concentration improve. No wonder children love our classes! Each term, there is a specially produced themed CD packed full of songs, dances and stories to enjoy at home. In The Magician's Chamber Album, children can join PF, Merlin the Master Magician and a colourful cast of characters including the graceful Queen Guinevere, the mystical Lady in the Lake and King Arthur and his legendary Knights of the Round Table. Whether singing Rabbit In A Hat or being swept away by The Broomstick Flick, this album is a mesmerising mix of enchantment, fantasy and illusion. 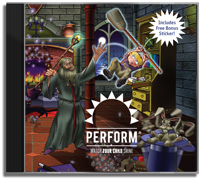 Now the mysterious world of the Magician's Chamber can be enjoyed at home too with the Perform Magician's Chamber app for iPhone and iPad. Download for FREE today from the App store and release some spellbinding songs, games and adventures. With wonderful wizard Merlin as their guide, children can perfect their spelling in Magic Speller, boost their concentration in Rabbits On The Rampage and express their creativity in Paint Pots & Potions. As well as weekly fun and the chance to make new friends, your child can take home a colourful sticker poster and a FREE CD* packed with songs and stories that will keep them entertained between workshops. As the weeks progress, they will also receive a special script to rehearse for a special end-of-term performance that family and friends can all enjoy. * Free CD offer applies to new sign-ups or when taking out a new Direct debit. Terms and conditions apply.